What makes a circular saw powerful and durable for daily woodworking activities? How much power does a circular saw need to have? All those are frequently asked questions about handheld circular saws. In this part of our circular saw series we will examine power and durability needed for professionally used circular saws. You should ask at least some of these questions before considering the purchase of any circular saw. Let's discover some details on how much power a circular saw should have. You may have head it said "the more the better!" This thought can be applied to the circular saws as well right? This thought continues "the more powerful your saw the better- right? WRONG! While motor power on a circular saw is important, it goes hand in hand with the weight of the tool... This leads ultimately to usability. The greater the power of your saw is - the bigger the motor - the heavier the power tool - and the less portable your saw will be. There are circular saws, such as the XL and XXL class, (as previously described) where motor power (horsepower) is more important than portability. But, on optimal weight, smaller and mid-size circular saws you want to have, will need a good balance between maximum and minimum power. 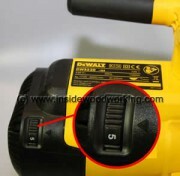 Some models of corded circular saws are equipped with a variable speed control. For the traditional woodworker or cabinetmaker, the variable speed benefit built into a circular saw may feel strange. Some power tool companies appear to be adding variable speed to their saws as a marketplace feature. Featuring a variable speed only makes sense if you intend to cut an array of materials as opposed to a specialized activity. For example, if you’re cutting aluminum, you would need to turn down the blade speed. For some plywood or engineered laminated materials reducing blade speeds to prevent splintering. In most cases its the quality and correct blade type which contribute to splinter free cuts. To sum it up, variable speed is one of the least needed features on a circular saw, if combined with constant speed control it is a desirable feature. 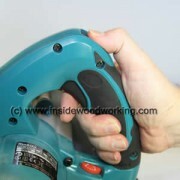 This Makita Plunge Cut circular saw offers excellent ergonomics. You'll find a Soft Grip handle combined with an easy to reach unlock switch for the plunge motion. You'll want to test any circular saw for weight and handling. Weight is especially important when you consider these small and medium saws. This is true if you think that you might want to hold the saw with one hand, while manipulating the material with the other hand most of the time. If the saw is too heavy or unbalanced it can be cumbersome it will find its way to your tool shelf forever :-). Does the saw sit well in your hand? Do you have a clear view of the cutting line as you hold the saw with both hands? Is the power switch within easy to reach and any are additional safety button easily pressed? Can the circular saw be switched on/off easily while wearing gloves? Is the tool handle 'slip free' and shaped well for your hand? If you examine a worm-drive saw, is it well balanced? Does it tend to tilt over especially on bevel cuts? As you see, there are important questions to be asked and answered about circular saws, before you think of buying a new one. Depth of Cut 90° up to 2-1/4"
Circular Saw Blade Diameter 6-1/4"
The above table is just a rough guideline for the recommended power and weight of a circular saw in each category. * Rec.Power = Recommended Power of corded circular saws. Groups for cordless circular saws see next page here. ** In some European countries 400 volt portable circular saws with up to 4350 watts and cutting depths of up to 10" (240mm) are available. These are "two man circular saws" such as the Mafell model FSG 240 K. With a depths of cut of up to 10" they still count as handheld circular saw. This and other saws, would be called XXXL 🙂 - aren't listed in the above table. After reviewing the power of electric corded circular saws in this section, we will have a look at cordless circular saws in the next part.